Made from extra-absorbent microfiber (80% polyester and 20% nylon) organic dyes, and silicon. The Mat-Size Yogitoes SKIDLESS Yoga Towel has a cult-following amongst hot yogis. If sweat or sweaty palms and feet have you sliding all over your yoga mat -- hindering your practice -- you will need to invest in a high quality yoga mat towel. Yogitoes Skidless Mat Towels make your practice more fluid, safer, easier, hygienic, and effective. Made from uber absorbent microfiber that can hold 8 times it’s weight in water, it will wick and absorb sweat. The bottom of the towel is covered in tiny silicone dots, keeping the towel in place on your mat throughout the most rigorous practices. The top of each towel has a drishti dot to aid in concentration and meditation. The sweatier you become, the stickier the towel will be. Spritz your mat with water before each use for best results. Wash your Yogitoes towel after every use to avoid foul odor and mildew. 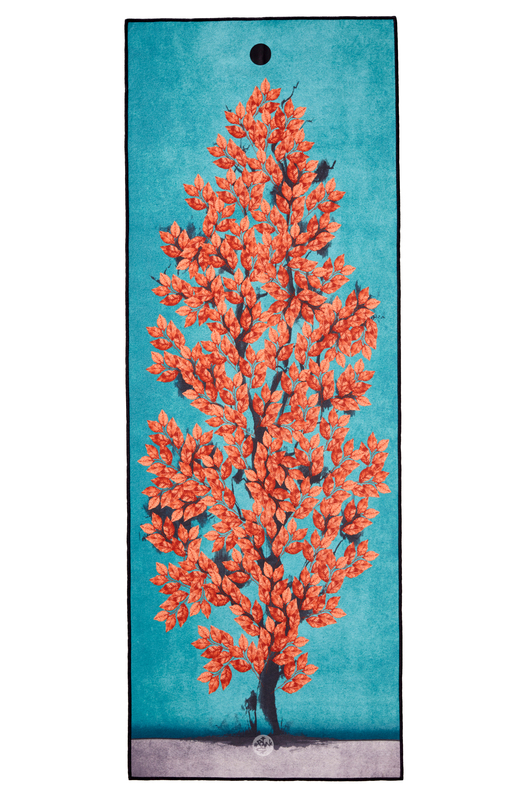 Yogitoes hot yoga mat towels will also protect your practice mat, extending it’s life. Choose from one of so many amazing color combos and themes. I love Yogitoes! It's very absorbent during hot yoga and it truly is skidless. I'm so glad I bought it! The colors are beautiful and bright and it really is skidless. My palms tend to sweat a bit but now I don''t have to wear gloves anymore coz the towel prevents slippage. Yogitoes delivers! I am very happy with the performance of my yogitoes towel. It absorbs gallons of sweat and stays in place. I highly recommend this product to any yogi who perspires as much as I do. Thank you. I have a bunch of these towels and I can''t live without them. I have used other websites in the past to get them, but yoga accessories offers the best price and also great colors and customer service. I don''t know how I did bikram yoga before I had this towel. It absorbs all of my sweat and provides me with a slip free sticky surface. I can wash my towel right away and clean off the sweat. This towel is something special. I don''t own a mat and I just use the ones that are provided by my studio. I place this towel directly over my mat and it is sticky as well as clean. I know when I clean my towel which is more than I can stay for the mats at my studio.